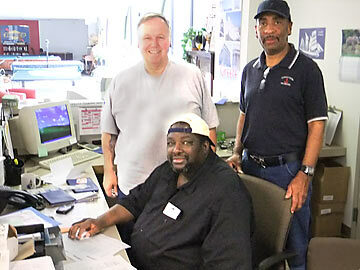 Photo: On duty at SCI headquarters are Frank Carmon, seated, and, standing from left, Steve Anderson and Al Blackman. For Al Blackman, Jr., of Philadelphia, a host/transporter at night for the Seamen’s Church Institute, part of the reward is seeing the difference doing little things can make in the life of a lonely seafarer arriving in the Port of Philadelphia. “I remember this one guy I met on ship,” he says. “The crew hadn’t been paid yet. He asked me if I could get him a tube of toothpaste. That’s all he really wanted. Getting it for him made such a difference. Stuff that you take for granted they are so grateful for.” Other memories have involved more substantive concerns. “I’ve helped a crewmember be in touch with a priest when there are problems at home. A crewmember had a baby with heart complications. It is just so rewarding when someone you are trying to bless is also blessing you.” Al, who works in construction during the day, and his wife, Charmaine, are members of Hope Temple Baptist Church in Philadelphia. The couple has a son, Al III. Steve Anderson, another night-duty host/transporter, remembers assisting another seafarer who was seriously ill. The man, a Filipino, was afraid about being so sick in an unfamiliar place. “We helped to get him to the hospital and explained to hospital personnel about the insurance coverage the ship’s company provided. I was able to console him and visited him the next day.” Steve learned about a nighttime job opening at SCI while working at his main job as part of the security force at Camden (NJ) Beckett Terminal. “I used to see the joy in seafarers’ eyes when SCI staff and volunteers showed up to welcome them to the port,” Steve says. “I wanted to be a part of that. That’s what I enjoy the most – seeing how their eyes light up when you come out to greet them.” Steve and his wife, Esther, belong to Holy Redeemer Catholic Church in Deptford, NJ. He has an adult son, Steve, Jr., who lives in Florida. Frank Carmon, assistant supervisor at night for SCI, has been engaged in his work at SCI for about six years. He heard about an SCI job opening from his brother-in-law, a security supervisor at one of the terminals in the Port of Philadelphia. He handles paperwork, attends to problems he hears about on ships and visits seafarers aboard ship. He figures he’s been aboard thousands of ships over the years. “I guess I remember most trying to console a crewmember who had just learned his wife had died back home,” he says. “He was so distraught. He just wanted to go home, but he couldn’t leave until his relief arrived,” Frank recalls. He urges residents of the region “to approach us and just take advantage of the chance to come out and board a ship and see what the life of a seafarer is like and hear their stories. They work so hard. They endure terrible weather. They are away from their families for 11 or 12 months at a time. Many are detained aboard ship when they visit a port because of security limits, so we may be the only American hosts they come in contact with.” Frank and his wife, Sandra, are parents of sons, Frank III, Khalil, and daughters Lasonya and Latwanza. He and Sandra are members of Bright Hope Baptist Church in Philadelphia. The night staffers also talk about the wide variety of goods Americans receive, thanks to the devotion of seafarers – cherries, bananas, pineapples, steel, pipe, fuels, cocoa beans, gypsum, salt, plywood – to name just some of the cargo varieties. Other night-duty staff include Dave McNeal, Jr., coordinator of the host/transporters during the evening, and Wilson Pettaway.